Election 2017 - what side are you on? Election slogans are generally meaningless, but in this election they clearly differentiate the offer. Comrades, left and right, should focus on that. 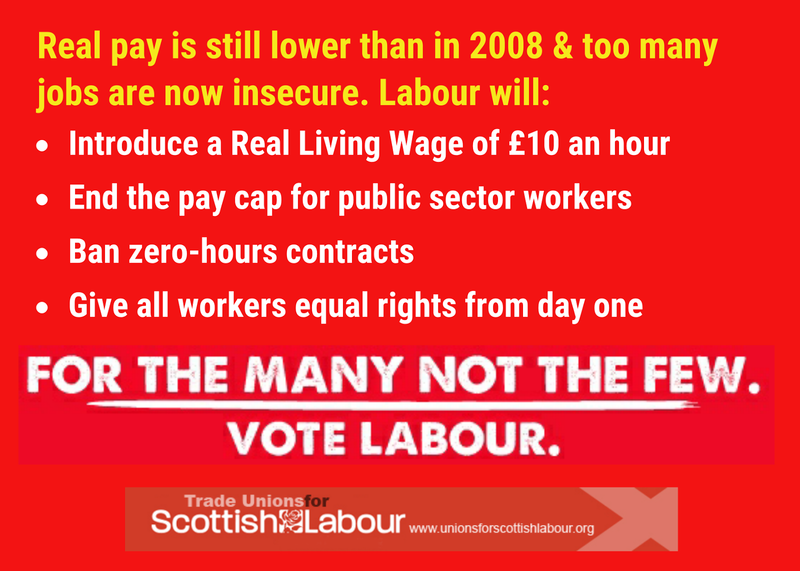 Today’s Scottish Labour manifesto will set out clearly why Labour is “For the many, not the few’. On workers rights, public services, tax and much else - Labour offers a positive vision of what a different country could look like. In contrast, ‘Strong and stable’ reflects the absence of vision in the Tory manifesto, which seeks to reward the rich and divide communities on age, Brexit, immigration and flags. From a left perspective, I have to admit a greater irritation with some comrades than normal in this election. A discussion with a friend, who has belonged to an array of fringe left parties, particularly irked me last week. His reaction to the UK Labour manifesto was, ‘I suppose it’s not that bad’. Really comrade, is that the best you can do? Reclaiming the railways, Royal Mail, energy and water (in England) into public ownership. A huge investment in public services that will provide a major boost to devolved services devastated by austerity. There is much more, as Gregor Gall (A left academic not slow to criticise Labour) highlights. 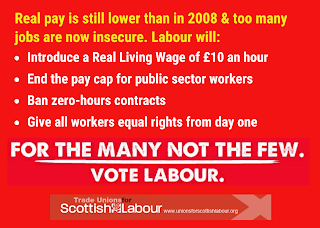 This is a manifesto that would make the workplace a much fairer place and make a real start it tackling the low pay and insecure work culture that is wrecking our economy. Yes comrades, it’s time to get a grip. Some comrades to my right also irritate me. This is well summed up by Peter Frost’s feature in the Morning Star, who gives us a timely reminder that Jeremy is not the first Labour leader to be vilified, even if this time the establishment has sunk to a new low. Even supposedly pro-Labour sites like Labour List have run several pieces about internal issues post-election. Yes comrades, it’s time you also got a grip. As Peter says, “I know what side I am on. I even know what side Kuenssberg is on. The simple question is what side are you on — and what are you going to do about it? Let’s not forget that this snap election was called because the economy is about to get even worse, exacerbated by the Tory approach to Brexit. After eight years of BofE stimulus - the economy is stagnant, real incomes are falling and inequality is rising. The financial markets are disconnected from the real economy and our public services are hanging on by a thread. So comrades’ left and right, get a grip, the stakes are too high to waste on carping and squabbles. This election is a pivotal struggle for the sort of country we want to live in – it’s time to remember what side you are on. Freedom of Information is an essential part of a thriving and effective democracy. Scotland needs to move from the ambition of support for open government, to putting the legislative and practical measures in place to strengthen it. Today, I was speaking at the Scottish Public Information Forum in Edinburgh, reconvened by the Campaign for Freedom of Information in Scotland. Margaret Keyse the Acting Scottish Information Commissioner (SIC) outlined the work of the SIC. There were 540 new appeals last year, 231 decision notices and dealt with 1554 enquires. Nearly 70,000 requests were made to Scottish public authorities, and that is probably an underestimate. There is a high general public awareness of FoI and support for the law, although that awareness is limited. They have regularly highlighted their concerns about the limited scope of FoI in Scotland. Recently, in a special report, the SIC argued that it is time for a substantial rethink on pro-active publication of information. Monitoring of the Model Publication Schemes shows that public authorities generally have them and are good at giving advice and assistance, but 79% don't publish open data. There are some big changes ahead. Not least European developments including a possible two tier approach to FoI and the General Data Protection Regulations that will come in before Brexit. Alison MacKinnon from SEPA focused on the Environmental Information Regulations 2004, an often forgotten aspect of FoI that came from older international information requirements. She gave an interesting insight on how they deal with requests, reminding us that EIR has a somewhat wider scope and fewer exemptions. There has been a steady increase in requests in recent years, still 40% from the public, but increasingly from consultants and industry. Paul Holleran from the NUJ outlined developments in the media and in particular the pressure on journalists due to reduced staffing levels. A particular concern is the big reduction in investigative journalism and that may explain the reduction in requests from journalists. The malaise of fake news and cuts in journalism, at national and local level, is undermining democracy. Ruchir Shah from SCVO made the argument that transparency is a political weapon and reflects a global challenge to inequality. There is a risk that people are speaking in bubbles, not to each other. He described the Open Government Pioneers Project, which is about building capacity in civil society as a way of increasing transparency and open government. A global movement that Scotland is a part of. Carole Ewart from the Campaign for Freedom of Information in Scotland described their latest project, sponsored by UNISON Scotland, looking at compliance and current practice. She argued that Scotland is some way from achieving an information rights culture and there was a need to integrate with human rights and other public policy initiatives. The Scottish Government needs to keep promises on FoI in areas like expanding the scope of FoI, cost thresholds, the previously moribund forum (SPIF) and pro-active information. UNISON's interest in FoI includes our campaigns function and as the union that represents most FoI staff in public bodies. My own presentation made the case for extending the scope of FoI to all those who receive the public pound. I also gave some feedback from FoI staff who are struggling to cope with the demand for information at a time of staffing cuts, particularly in administrative functions. There are also capacity issues in the departments who have to provide the information. Staff also identify resistance from senior management and poor awareness of FoI amongst some senior colleagues. I also gave examples of poor compliance based on our own experience of making FoI requests. We are experiencing examples of public bodies simply not responding or using delaying tactics. Examples include daft points of clarification or references to online documents that don't actually include the information we asked for. Others deliberately avoid the question, by answering a question we haven't asked. We often have to go back several times before we get a proper answer. There was a really useful discussion on the practice of FoI in Scotland. A big theme is that we have some grand rhetoric on open government, when the reality falls far short of that language. A good example this week is the Justice Committee scrutiny of the Scottish Police Authority, holding its meetings in private. There is some evidence that organisations who receive the public pound through contracts or grant funding are discouraged on the grounds that 'don't bite the hand that feeds you'. There are many ways of getting around this, given that anyone can make a request. There is some concern from bodies not currently covered, such as housing associations, about their capacity. There is clearly a need to improve skills in making requests as well as strengthening public bodies capacity to respond. In these challenging political times, there has never been a greater need for open government and transparency of information. This is a field that Scotland could be a world leader, in vision and practice. Today's event shows we have much to do, but there is a willingness to make the journey. Musical chairs around the council chamber won't alter the challenges facing local government in Scotland. The voters have had their say and there are a lot of new councillors taking responsibility for our vital local services. The Tories made the headlines with large numbers of new councillors and they delivered a share of the vote in line with recent opinion polls. The SNP held onto their council seats, but as 2012 was a disappointing year, they expected to do much better. Their share of the vote was significantly down on current polling, even allowing for the share that goes to independents. It remains to be seen if this reflects the passing of 'Peak Nat'. The SNP's hostility and underfunding of local government, coupled with the lower turnout, may result in differential voting in local elections. For Scottish Labour, the share of the vote was significantly higher than recent polling, although that didn't protect all those elected in the fairly good 2012 elections - well before Indyref and the binary proposition that Scottish politics has become. Ironically, many councillors who bitterly opposed PR, now have good cause to be thankful for the system. Nearly half of Scottish Labour councillors are new, a very welcome development and an opportunity for Labour to move away from an often stale administrative approach to local politics. The post-match analysis within Labour falls back on how unionist Labour should be. The problem will always be that few Labour activists get out of bed in the morning to defend flags of the unionist or nationalist variety. Socialists want to change society and therefore Scottish Labour simply has to work in that middle ground that is not obsessed by the constitution. With every council in no overall control, PR has delivered the sort of political balance you would expect. This week will see a variety of local agreements and some new local alliances. The media prediction of pro-union coalitions may not be realised, given Scottish Labour's strong anti-austerity coalition framework. The Tories created austerity and the SNP dumped it on local government, so neither make attractive coalition partners. However, when it comes to progressive local priorities, SNP and Labour councillors will probably be closer than they are with the Tories. Whoever leads our councils they are going to face some difficult decisions. This year was not the worst financially, with the extra revenue from council tax bands and in some cases the basic rate, mitigating the revenue cut from the Scottish Government. Many councils plugged the remaining gap with reserves, putting off some difficult long-term decisions. The next two years are likely to be much more difficult if the Tories are re-elected and continue with their failed policy of austerity. Councillors will be pressed by officials to make difficult structural changes to services rather than the salami slicing of recent years. They will also be faced with service reform proposals. Some will be local, often based on tired old top down solutions like shared services. Others will come from national changes driven by the Scottish Government in areas like schools and early years. Then there is the planned review of local government. In four years time councillors might find that local government is withering on the vine, unless they learn quickly to stand up for local government. The unhelpful Local Government Partnership should come to an end and local government should once again speak with something close to one voice through COSLA. It will be interesting to see how effective the new political dynamics within COSLA will be in standing up for local democracy. So, congratulations to all those elected last week. I'm sorry I can't paint a rosier picture of the challenges ahead, but it's worth remembering that few councillors were elected on an austerity ticket. Even Tory leaflets called for more and better local services. Councillors should defend local services and those who deliver them. Three days to go to polling day for the council elections - just in case anyone noticed. Even before the general election was dumped on us, national issues dominated the debate. If the parties want to debate the constitution they might at least give some consideration to the local. The debate around constitutional change in Scotland is primarily focused on what powers come from Westminster to Holyrood. 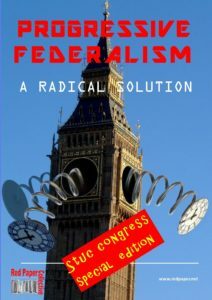 In the latest Red Paper 'Progressive Federalism' publication, I argue that federalism should be based on the concept of subsidiarity - the idea that decisions should be taken at the lowest practical level. I recall listening to a debate at an SNP conference when a delegate proudly proclaimed, ‘Scotland is our local’. In fairness this declaration wasn't received that rapturously and I don’t think it's true even in an independent Scotland. However, it shouldn't be the starting point for debate. Local government in Scotland is facing huge pressures. Primarily financial because while the overall Scottish budget is largely determined by Westminster, the Scottish Government decides where the axe will fall. They have chosen to cut local government disproportionately. This is in part a consequence of giving some protection to the NHS budget, but arguably also because of some antipathy towards local government. There is also the added political advantage of pushing difficult decisions away from ministerial desks – the ‘not me guv’ school of politics. 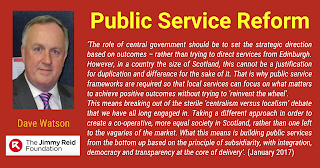 Early public service reform initiatives from the SNP government were largely centralist – most notably Police Scotland and the Fire and Rescue Service. Possibly due to that less than positive experience, ministers have moved to more subtle ways of centrally directing services. This is achieved through extensive ministerial powers of direction, as in health and care integration; or by using quangos to direct policy while leaving delivery local, as with community justice. The current proposals for education governance include regional boards and ministers allocating funds direct to schools. Marketisation is also making an appearance, with voucher schemes for early learning and childcare. There is to be a review of local government, although at the present rate of progress, local government is simply withering on the vine. Local government has not always responded well to this onslaught. Many councils have simply become the passive administrators of austerity, rather than standing up for their communities, as I argue in the January issue of Scottish Left Review. So, how might federalism offer a new start for local democracy in Scotland? A federal Scotland should ensure that decisions are taken at the lowest practical level. While it is important to have national standards and guidance, these should not be used to stifle local innovation or local differences. Services should be designed with and for people in communities of place and interest. Co-production and asset-based approaches can contribute to this as a positive engagement not simply to manage budgetary cuts. In a practical sense this means looking at every power that is devolved to Scotland and asking the subsidiarity question – can this be done locally? 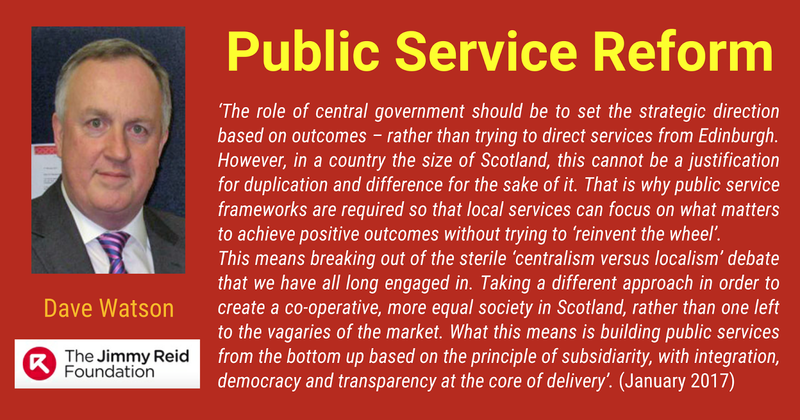 In my Reid Foundation paper on public service reform I point towards an even more radical approach that starts with people and communities and consider what powers are granted up to local government and central government. In essence people locally agree to share sovereignty with local, regional and national structures, because that is the most effective way of achieving our collective public service ethos. This leads to the question of what we mean by ‘local’ or even a recognisable community of place? Is it a street, a village, a town or a city? Again, if we apply the principle of subsidiarity, it is the lowest practical level and that is probably roughly a town and its hinterland. Cities are more difficult to break down into recognisable communities, but it can be done. At this level we can introduce better integration of services and meaningful engagement with citizens. In a column in The Scotsman, I describe a number of initiatives that could create a new culture of engagement. These include the Co-operative Councils Network, the Carnegie Trust’s ‘Enabling State’ and Participatory Budgeting. None of these ideas offers a perfect solution, but they do point to a more meaningful collective engagement of citizens than traditional consultation mechanisms. This is not a clarion call for pure localism. In a country the size of Scotland we cannot justify duplication and difference for the sake of it. There is a role for central government to set outcomes and possibly even minimum standards, while avoiding prescription and central direction. They could agree frameworks (workforce matters is a good example) that allow the local to focus on what matters. So, even if constitutional issues are uppermost in your mind when you vote on Thursday, they should still have a local dimension. We need to go much further than simply shifting more powers from Westminster to Holyrood. We should turn the traditional ‘hand me down’ approach on its head. It starts with the local, building up to the nation state. In our geographically, economically and culturally diverse country - Scotland is certainly NOT our local.